so far, my miso recipe included nobu miso cod & miso belly pork. in that recipe, the miso used was quite substantial to infuse the flavour into the meat. i feel the miso cod texture is a bit firmer than the normal texture, and for miso belly pork, it works well also for thicker & whole piece of meat. the cured salmon that we always had in bento in japan felt different. so i was thinking of other marinade recipe options. 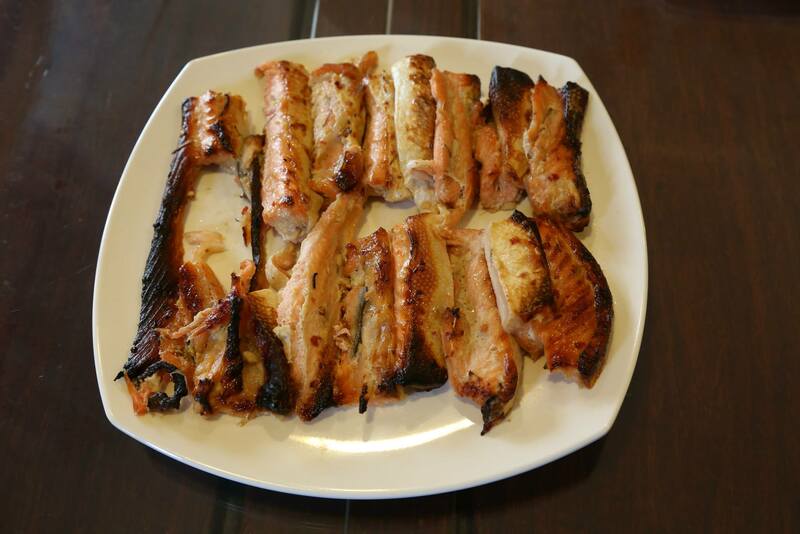 my friends loved it when i cooked this for the first time for 11pax lunch on 15.10.2014. and it was the same for my family for the 6pax family dinner on 24.10.2014.
for the marinade, i just mixed in a large bowl 1 tbsp light soy sauce, 1 tbsp mirin, 1 tbsp sake, 1 tbsp sugar, 2 tsp chopped garlic, 2 tsp chopped ginger & 1 tsp miso. 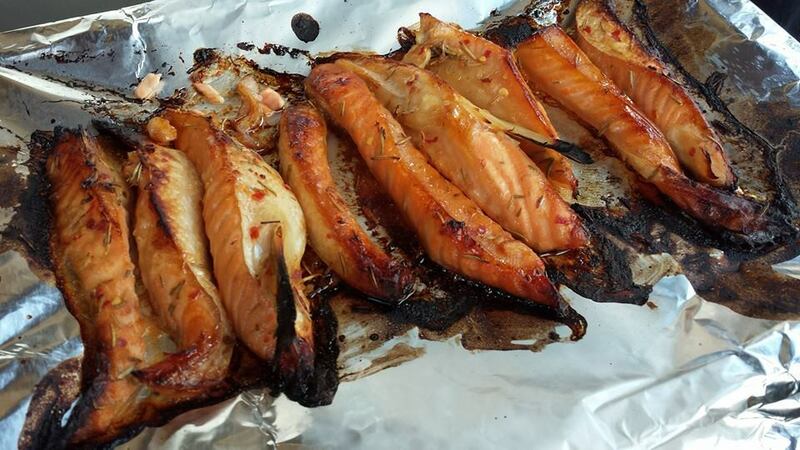 then i added the salmon (belly) to the bowl & marinated really well, thoroughly. then i used cellophane to press down on the salmon in the bowl to press it against the marinade & sealed the meat from air. the i used another cellophane sheet to cover the entire bowl. i left it in the chiller for 3 days for the flavours to infuse the meat. 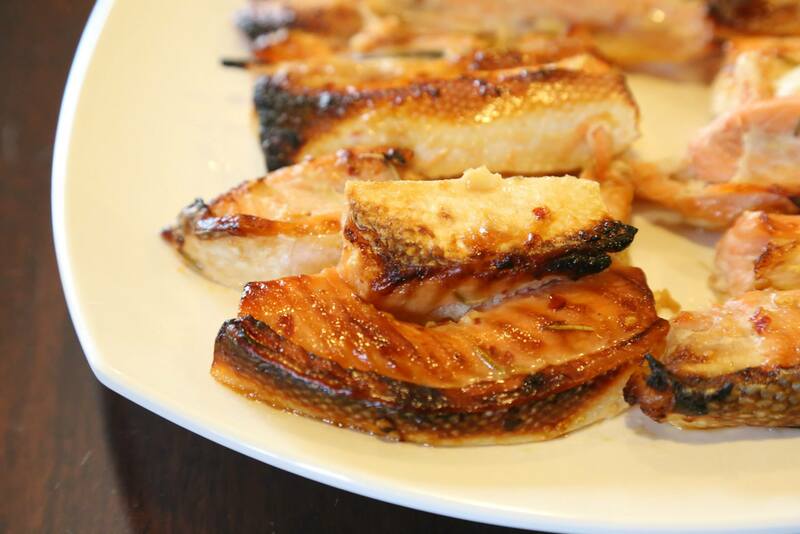 prepare marinade – in a large bowl mix 1 tbsp light soy sauce, 1 tbsp mirin, 1 tbsp sake, 1 tbsp sugar, 2 tsp chopped garlic, 2 tsp chopped ginger & 1 tsp miso. 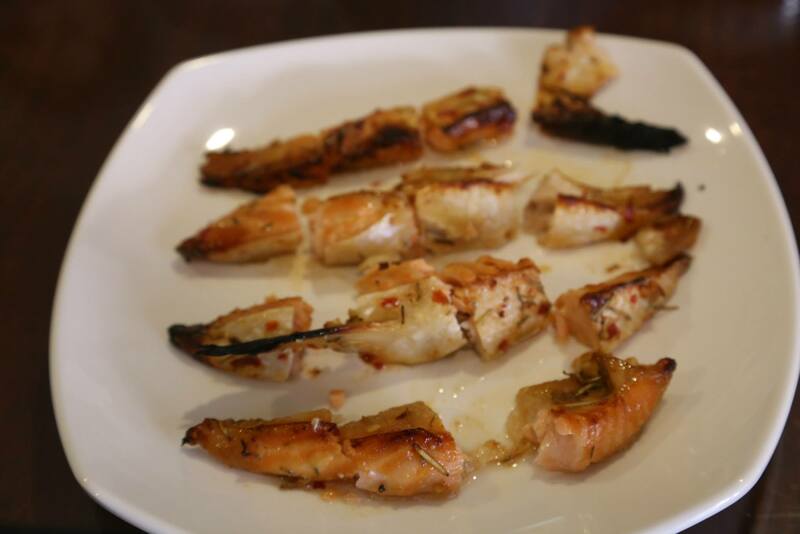 add salmon (belly) to the bowl & marinate really well, thoroughly. 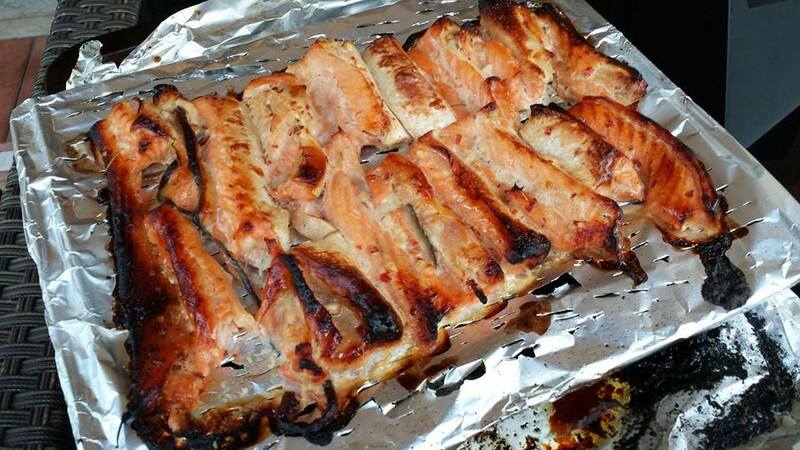 use cellophane to press down on the salmon in the bowl to press it against the marinade & seal the meat from air. use another cellophane sheet to cover the entire bowl. leave in the chiller for 3 days for the flavours to infuse the meat. cooking – take out from chiller for 1 hour to get to room temperature. 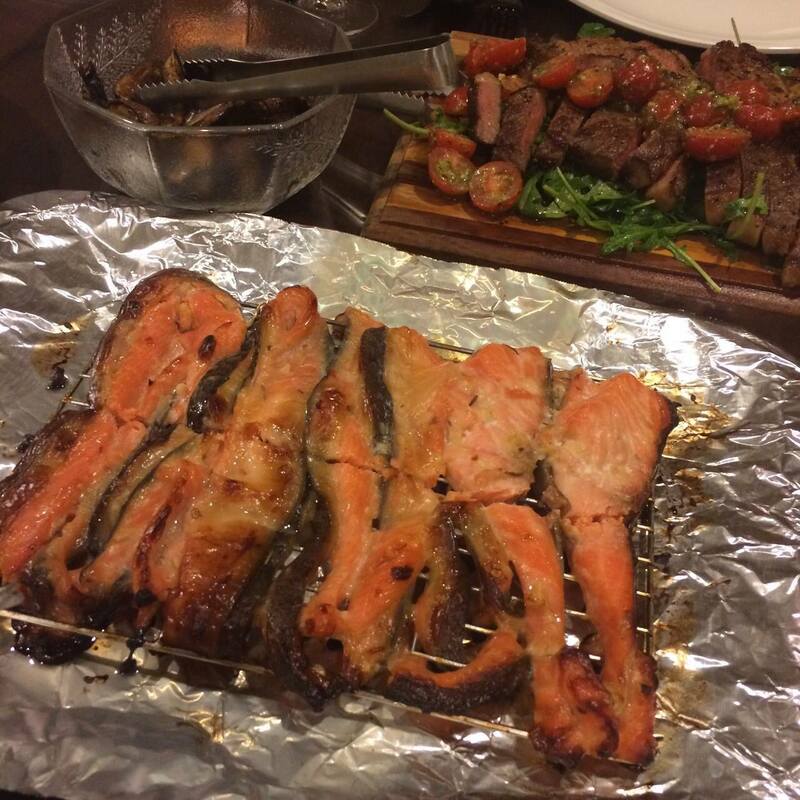 line a grilling rack with aluminium foil & poke holes in the foil to drain excess oil. place over a lined oven tray in a pre-heated 250deC oven for 10minutes. serve. This entry was posted in Buon Appetito! and tagged marinade, miso belly pork, miso salmon belly, miso sliced belly pork, Nobu miso cod. Bookmark the permalink.